OPINION / ADVERTORIAL – Residents of St. George enjoy over 300 days of sunshine a year on average. What you may not realize is that you could be turning that statistic into dollar signs. Many residents have already begun to utilize the sunny weather by installing solar panels on their homes and in turn creating their own personal power plants. When the technology first emerged, the price to buy was high and the misconception grew that solar energy was only for well-off consumers concerned with the environment. Years later, the solar energy business has exploded, honed in on new technologies, and in turn has become much more affordable for everyone. In fact, Alldredge said, by installing a solar panel system on your home instead of paying an electric utility bill every month, you will save money in the long run. Not only is it good for your wallet, but the technology increases the value and appeal of your home if you are ever looking to sell. On top of that, the technology has become big business and created new jobs all over the state. Alldredge and his partner Shane Perkins began their journey into solar energy about four years ago. Taking the first year to familiarize themselves with the business and research, they became experts in the field. Since then, the business of Legend Solar has tripled in size, serving customers in Las Vegas, Northern California, Idaho, Arizona, and Utah. The old saying goes that you get what you pay for, and it’s no different when it comes to solar panels. When looking to invest in something that has a return, you obviously want a product that won’t break, has a good warranty, and produces the maximum so you get the most bang for you buck. Utah residents are somewhat behind in their awareness of the affordability of the technology, Alldredge said. Surrounding states like California and Nevada have begun taking advantage of solar energy. City of St. George council members gave verbal approval on Dec. 11 for an additional charge to residents using solar power who are still connected to the city’s grid. This motion was proposed so that if for any reason a house generated by solar energy loses power, they will be able to receive power from the grid. For most, the capacity charge won’t be significant, Alldredge said. Besides the long-term investment, another perk of solar energy is that when you install a system, you are eligible for a federal tax credit of 30 percent as well as $2,000 from the state of Utah. In addition to the tax credits, Rocky Mountain Power will be offering the Utah Solar Incentive Program beginning Jan. 15 and ending Jan. 28. 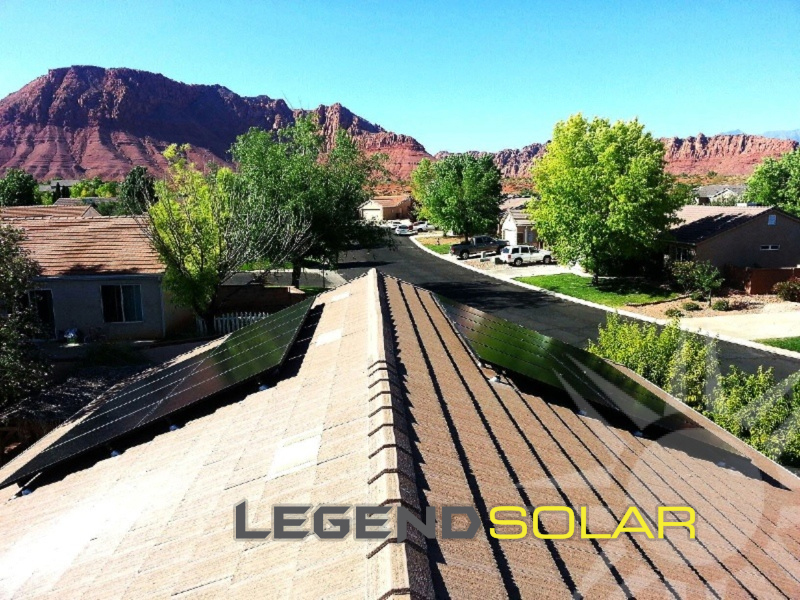 Those interested in installing a new system or those looking to expand their current system should contact Legend Solar so they can fill out an entry submission for them. Rebates are estimated around a couple thousand dollars, Alldredge said, but vary depending on installation size. 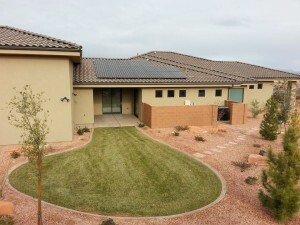 During this year’s annual St. George Area Parade of Homes, which will showcase 28 homes, Legend Solar will be at two separate houses displaying its renewable energy systems. The parade will take place Feb. 13-22, and Legend Solar welcomes curious people to come see first-hand how the systems function. With the new technology that has emerged in the industry, the affordable costs, and reliable warranties, there’s no reason not to look into solar energy for your home. Ed. note: Taxpayers are advised to review the links provided regarding federal and state tax credits and to consult a qualified tax advisor. I find it interesting that with all the hoopla about RMP’s attempt at a surcharge on solar users, St. George is quietly slipping one in and it isn’t making the headlines. Solar is great for your wallet as long as you stay away from the expensive solar lease and PPA financing model . At today’s far lower pricing, it is far better to purchase your system outright that it is to rent a system from an expensive solar leasing company. Today you can purchase a name brand, grid tie solar system for less than $2.30 per watt after applying the 30% federal tax credit. That translates into less than $11,000 for an average sized 4.7 kW solar system that can produce up to 600 kilowatt hours of electricity per month with only 5 hours of peak sunshine per day. If you’re considering a lease, not only will the system cost you far more in the end but you’ll also probably have problems when trying to sell your home because what home buyer in his right mind will want to assume your lease payments on a used, outdated system when they can buy a brand new system with the latest technology and keep the 30% federal tax credit for thousands less. YOU ROCK!!!! Thank you so much for writing that post. Buy=yep, rent=no way. Solar power is viable for only one reason: massive Federal and state subsidies. With the Feds paying for 30% of system cost and Utah chipping in $2000, almost any home improvement would be attractive. And it’s the rest of us who are subsidizing all these solar jobs and making solar power attractive to the few…for now. Why for now? Because only fossil fuel and nuclear power plants can provide 24 hour power on demand and are the lowest cost options. http://en.wikipedia.org/wiki/Cost_of_electricity_by_source Solar and wind power are intermittent and their users will always require power at night and during calm winds. Hydro and geothermal are wonderful but limited resources. Less than 30% of coal power costs come from the coal itself; about 70% of natural gas power costs come from the gas itself. In both cases, the cost of building and maintaining the plant itself makes up the rest of the cost. So who is going to pay for these fixed costs? The answer of course is everyone, even solar power users who need electricity for maybe 16 hours per day. And that cost will be considerably higher than the $10 per month fee currently being discussed by the St. George City Council. There are a number of subtleties around this subject that are too lengthy for this comment board. But the bottom line is this: solar is among the most costly power alternatives. But it is loved and supported by global warming true believers in spite of the lack of any warming for the last 16 years while carbon dioxide levels have increased by 25%. No model–not one–can explain this. Yet the warmists have only these models on which to base their faith. I disagree it isn’t viable without subsidies. Even without subsidies the ROI is still there, it just takes longer. The subsidies just sweeten the deal and help people pull the trigger now, and early adopters help get these technologies off the ground. But you’re missing one great benefit solar offers to everyone: more reliable power during peak times in the summer. In the past you’d have quite a few days where the grid would overload and we’d lose power because too many people were drawing power for their AC all at once during peak times. With solar those peak times correspond to the peak times production times, providing a very good offset and keeping the grid online for everyone. The reality is that solar technology is getting better and cheaper and every other power source is getting more expensive and more scarce. Early adopters help the better / cheaper trend and pay big dividends in the long run. That can certainly be taken to the extreme (like Georgia right now basically paying 100% of the two year lease for a Nissan Leaf with a $5,000 tax credit; that’s nothing more than socialism / crony capitalism). I agree that solar lowers peak power requirements in desert locales. The alternative is natural gas generators that can be started and stopped much more readily than can coal fired plants. Natural gas continues to be cheaper than solar which is why Obama touts it as preferable to coal instead of forcing solar on utilities. Early adopters do help bring down costs but they’ve still got a long way to go. Utilities would jump at the chance to go 100% solar for peak power if they could justify it, but they can’t…yet. I’m more in favor of solar at the home level than the utility level. Line-losses are significant, so it’s just more efficient to be where the usage is. And many already have ideal south-facing roofs, so no reason to plow down thousands of acres of desert to put it in a centralized location. As electric cars become more popular they can act as batteries, too, further helping carry the load at peak times. The Leaf can already feed 6kw back to the house for emergency use. Hopefully new battery tech makes this even more useful in the future. Only the dull witted, or malicious, doubt that anthropogenic global warming is taking place. Which are you BIG GUY? Your faith in models that don’t fit what is observed is impressive…or dull witted. Please name the climate model that explains no worldwide temperature change for 16 years with a 25% increase in carbon dioxide. Science seeks to explain observations; it does not hold fast to previous assumptions if they don’t fit the facts. Which models and which data? How do you measure the “temperature of the earth”? Just coming up with a methodology for measuring surface level air temperature in a consistent way at weather stations is fraught with difficulty. Now consider trying to measure the temperatures in the middle and upper atmosphere and the oceans –which are ill-understood and very sparsely instrumented– and it’s clear that even knowing what is happening right now with global temperature is a very hard problem. Now, how do you go into the past, or forward into the future with and certainty? My point with the above is that neither BIGGUY nor Bender are equipped to make a informed decision on the validity of man-made global warming based on the data alone. What to do then? Trust the scientific method. Bender is tossing in with the almost unanimous majority of the science community. BIGGUY aligns himself with the demagogues and the AM hate radio hucksters. BENDER, the scientific method is 1) examine data, 2) propose a theory that matches and explains that data, 3) use the theory to predict future data, and 4) compare future data to theory predictions. Global warming fails on step 4 therefore the theory must be wrong. You state worldwide temperatures can’t be measured with any accuracy. I’ve never heard any climate scientist making that argument, certainly not those coming up with the original “hockey stick” or those contributing to the U.N.’s more recent climate reports. You’re the first. But if somehow that were true, it makes my case even stronger. Scientists have developed climate models that predict global warming but you believe that the models can’t be verified with data. Nonetheless, you and other global warmists believe these unverifiable models and want all the world to spend literally trillions of dollars to reduce anthropogenic carbon dioxide. And when (unmeasureable) temperatures don’t rise in the next 10-20 years, warmists would congratulate themselves on averting a disaster. Meanwhile, the world would be that much poorer for not having invested that money in productive ways. How can anyone other than a “dull wit” (your term) want to spend our money that way when he claims we’ll never be able to measure the results? You and the liberal elite in government and the media live in a fantasy world. Grab onto an idea and don’t let facts get in the way. Liberals are interested in “doing something.” Conservatives are focused on results. As I have stated earlier, the opportunity for savings with solar power is to reduce the peak power usage. Additional power plants need to be built when there is not enough capacity to handle peak capacity, and who wants the expense of building more power plants? 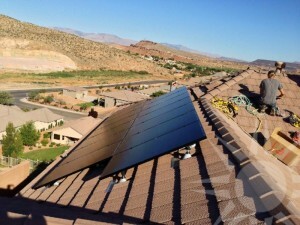 Happily in St. George the peak power usage occurs when the most solar power is available, namely during hot summer afternoons. If we could have enough solar power installed to reduce that peak usage then everyone could benefit. As has been mentioned there could be issues if we had too much solar capacity, but we are not close to that situation. New solar panel installations should point the panels somewhat to the west rather than due south in order to be more effective in the later afternoon and early evening when the cooling demand is still high. We will need to update our power box and my tech nerd husband has me convinced that we need to do solar power. We happen to live across from a (very smart) electrician who makes his career installing these systems. His home is entirely ‘off the grid’ and for the past ten years or so he has sold power back to the utility department. We wanted it…but couldn’t get it. Why, because installing this system involved installation specifics that our house could not support. We learned that if you are going to remodel or buy a home that is the correct time to decide about alternative energy; when the duct work, electrical panels and overall strength of the structure can be manipulated….not twenty years later. The scope of our improvements did not allow for the switch. BUT, there are packages that only run water heaters or only run exterior lighting…we’ll likely be doing that when it’s feasible. And never will be “off the grid” unless he uses no electricity after about 5 PM or so each day. He’ll need to pay his share of power company fixed costs just like you and me. Big Guy, he already does that if he’s connected via his minimum billing amounts. My question to those who kick and scream and insist solar users pay an additional fee is: what if I became ultra energy efficient just by installing super low use equipment and only using the bare minimum of electricity that I need? Are you going to add a surcharge to me for being so efficient that my consumption doesn’t cover the fixed costs? HUNTER, consider this dilemma. If everyone in St. George installed solar power and sent as much power back to the city during part of the day as they used at other times, then no one would have to pay anything for electricity: it would be free. Right? Of course not. So the issue is how to equitably charge all citizens for the electricity they require at certain times. One method is to institute an additional fixed fee each month. Another is to charge a higher rate for electricity used than is paid for electricity sent back by a solar power user. In other words, charge solar power users electricity at a “retail” price but buy electricity back at “wholesale.” The difference would cover the power generating utility’s costs. I would be in favor of the latter as more equitable; it addresses your issue with the super efficient user. But as of now, the city has no way to track usage vs. returns: it can only “spin the meter backward” and so today’s solar users are not paying “their fair share.” New electrical meters would be needed for every solar user. There may be other ways to solve the dilemma but a fixed charge is the city’s only near term solution to make solar users pay something closer to their fair share. Hope this helps. Yup Obama is gonna save us all with the miracle of solar power. Bahahahahhaha. Solar Panels are the best alternative source of energy that is highly efficient and can serve a huge purpose. Even their costs have come down considerably that makes it much more affordable at!! I perfectly agree with you, five years ago I wanted to buy solar panels and get them installed on my roof but they were so expensive at that time that I had to wait and save up some more money. I bought them last year and got them 10% cheaper. I confirm solar panel is really good for your wallet, you can check this map to find out how much you could be saving http://www.briteenergy.com/solar-energy-facts/ Solar energy is good for all of us as it helps saving money but most importantly it helps preserving our lovely planet. I think more needs to be done in order to raise awareness to homeowners, as they hold the power to create further demand. Furthermore, I also believe businesses fail to understand how integrating solar power into their business could help improve sales and create customer loyalty to their brand.